SEATTLE, Jan. 18, 2018 /PRNewswire/ — Alaska Airlines and fashion designer Luly Yang debuted a modern, West Coast-inspired, custom-designed uniform collection today. At a fashion show this afternoon inside Alaska’s Sea-Tac hangar, employee models walked the runway, showcasing over 90 garments and accessories to thousands of employees. The design, which has been more than two years in the making, will clad 19,000 Alaska, Virgin America and Horizon Air uniformed employees starting in late 2019. Employee models from across the company show off Alaska Airlines’ custom designed uniforms unveiled Jan. 18, representing a fresh, modern West Coast look. Seattle-based designer Luly Yang’s flight attendant uniform features multiple pockets, custom-branded buttons, zipper pulls, newly styled wings and name tags. Alaska Airlines, Horizon Air and Virgin America flight attendants model various styles being tested over the next 60 days. The flight attendant dresses feature asymmetrical hemlines, pops of color and custom-branded reversible belts. The dresses are complemented by an original Luly Yang Aura scarf. Alaska Airlines, Virgin America and Horizon Air ground and maintenance workers show off the new uniform collection featuring several layered mix-and-match pieces making it flexible for employees who work in different climates. Employees from Alaska Airlines’ regional partner Horizon Air show off the range of new uniform pieces. 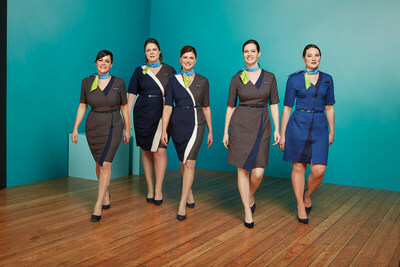 The Horizon collection complements Alaska Airlines’ uniform collection and includes signature wings and Horizon’s logo. The uniforms make their official debut next week, with 130 employee wear testers – flight attendants, pilots, customer service agents and lounge employees – putting the uniforms through their paces for the next 60 days. On the blog: See Luly’s design sketches come to life. Alaska began the project by surveying thousands of uniformed employees; following up with focus groups and work site visits to understand the features different workgroups wanted to see in their new uniforms. Overwhelmingly, the top requests from employees were more pockets and designs that look great on all body shapes and sizes, as well as performance over a range of climates. The collection is designed to be layered so that employees can self-regulate comfort while working in the freezing temperatures of Barrow, Alaska, to the balmier weather of Mexico. Using this research and information she gathered from face-to-face interactions with employees across the system, Yang spent two years designing and creating a signature silhouette for the Alaska program. Her focus on fit and function enabled additional touches including water resistant materials, active wear fabrics, longer shirt tails that don’t untuck from skirts and trousers, and flexible textiles that move with the body. Seeking high quality and transparency in the manufacturing of their uniforms, Alaska selected uniform supplier Unisync Group Limited of Toronto. An industry leader, Unisync is one of the largest uniform suppliers in North America. Working in close partnership with Yang, Unisync produced custom fabrics, buttons and signature accessories for the new program working to ensure the garments provide optimal on-the-job performance, while also reflecting Alaska’srefreshed brand. “Unisync is thrilled to be the selected partner of Alaska. We’re looking forward to contributing our experience and expertise and providing the best program possible for Alaska’s 19,000 employees,” said Michael Smith, Unisync’s senior vice president of service and supply chain. Before the designs, before the first stitch, and before the first button sewn, Alaska took steps to ensure that employee uniforms were safe and high in quality. Alaska Airlines, in partnership with Unisync and OEKO-TEX, will ensure that every custom uniform garment receives STANDARD 100 by OEKO-TEX® certification. This standard was developed in 1992 by the International OEKO-TEX Association, a consortium of 15 textile research and testing institutions in Europe and Japan with offices in more than 60 countries. OEKO-TEX STANDARD 100 is one of the most progressive textile standards in the world and is known for ensuring that textiles are free of potentially harmful substances and allergens. This standard is used by retailers, including Pottery Barn, Calvin Klein, Under Armour and children’s-wear company Hanna Andersson. STANDARD 100 by OEKO-TEX® ensures that substances used in textile production of a garment meet or exceed global safety standards; it also requires suppliers gain certification to produce each garment component, down to the color, material, thread and dyes. In total, Alaska’s new custom uniforms will incorporate over 100,000 zippers, over 1 million buttons, over 500,000 yards of fabric and will use well over 30 million yards of thread in the final program. Editor’s note: Photos from the event will be shared using the hashtag #FlyFashion across Alaska Airlines social channels including Instagram, Facebook and Twitter. High resolution, broadcast quality b-roll, and photos will be available at blog.alaskaair.com by 8 p.m. Pacific time, Jan.18. Alaska Airlines, together with Virgin America and its regional partners, flies 40 million guests a year to more than 115 destinations with an average of 1,200 daily flights across the United States and to Mexico, Canada and Costa Rica. With Alaska and Alaska Global Partners, guests can earn and redeem miles on flights to more than 900 destinations worldwide. Alaska Airlines ranked “Highest in Customer Satisfaction Among Traditional Carriers in North America” in the J.D. Power North America Satisfaction Study for 10 consecutive years from 2008 to 2017. Learn more about Alaska’saward-winning service at newsroom.alaskaair.com and blog.alaskaair.com. Alaska Airlines, Virgin America and Horizon Air are subsidiaries of Alaska Air Group (NYSE: ALK).